“Bucks County Historical Society’s Museum Exhibit Declared Greatest in World,” declares one newspaper headline. The year is 1916, and the avid ceramicist and gentleman archaeologist Henry C. Mercer has just completed the construction of the museum that will eventually bear his name. Almost a century later, can the Mercer Museum’s exhibits still lay claim to being the greatest? 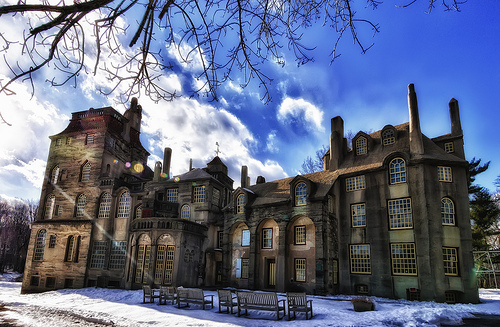 Fonthill, the home of Henry C. Mercer. Photo by James Loesch via Flickr. About an hour north of Philadelphia lies the quaint suburban enclave of Doylestown. Like many smaller Pennsylvania towns, you will find find lawyers milling about the courthouse and antique-hunting tourists ambling along the shop-lined streets. However, one thing that sets Doylestown apart is the castle that sits just off the town’s main drag. This 6-story fortress built entirely out of concrete would not be totally out of place in the late-Middle Ages, but instead of housing royalty, it contains one of the world’s most extensive collections of pre-Industrial tools. It is difficult to prepare for the Mercer Museum. To say that the collection of tools in a rural Pennsylvania castle threw me off my traditional museum-going game would be a bit of an understatement. Fortunately, the museum strives to orient visitors right from the start. As you enter the exhibit space, there is a sign outlining 18 commonly asked questions about the museum, the collection, and the man behind it all; and it directs you to where you can find the answers to these questions in the exhibit. I should have read these questions more closely because one especially — “Why Are Objects Hanging From the Ceiling” — might have prepared me for what lay ahead. The small entry hallway is lined with ceramic tiles depicting craftsmen at work and brief blurbs of text that attempt to answer the difficult matter of “What is This Place?” Once past these initial display pieces you enter the heart of the museum: a central courtyard with six floors spiraling upward. Photo by krooooop via Flickr. This space is so far from the sterile corridors of the modern museum that for a moment you just have to stare. There is stuff everywhere, and yet it is not uncomfortably cluttered. In one sense it is much like a blown-up version of a Victorian cabinet of curiosity, which is to be expected given the era in which Henry Mercer was collecting — 1870s-1920s. In another sense, it seems like a scene fresh out of a Harry Potter film, where the staircases will move on a whim and the figures in paintings flit from frame to frame. Overall, the first glimpse of the space is like a happy gulp of wonder; rarely have I been so magically transported by simply entering a museum exhibit. After taking a moment to drink it all in, you can finally begin to notice the details. Four floors above you a stagecoach looks out over the bow of a whaling boat complete with harpoons. Just ahead Buffalo Bill presides over an army of carved Indian tobacco shop statues, which according to the label were the most popular advertising signs for such shops for nearly three centuries. Wandering down offshoot alcoves leads you to rooms dedicated to shoemaking, hornblowing, and sheep shearing. There is a glisten off of the rows of redware pottery and furniture hangs from the ceiling above. Visit the old printing press or spend some time with the gathering of meat preservation tools before passing the galloping weathervanes on your ascent. Looking closely at the patterns used for creating wallpaper and discovering just how poorly modern plastics are at recreating the uniqueness of tortoiseshell combs are just a sampling of the tidbits of knowledge that can be acquired amid the warren-like maze of the Mercer Museum. By the time I reached the sixth floor and encountered an old hearse, I felt as if I was an accidental walk-on in a unpublished Gothic novel, sneaking around in an old English attic with Mr. Rochester about to pop out behind the next bend in the wall. And that is the funny thing about this museum. A collection of tools sounds like a rather dry subject on paper, but at the Mercer, with the objects arranged in a haphazardly organized method in this quirky castle built specifically to be their home, it is transformed into an almost romantic experience. To “cultivate…a broad appreciation and awareness of the past, helping people find stories and meanings that both sustain them in the present and aid them in approaching the future.” Such are the aims of the Mercer Museum, which they share with their larger parent organization: the Bucks County Historical Society. As far as mission statements go, it falls far short of capturing the essence of this curious castle-bound collection. Where does the Mercer fit in the greater pantheon of museums, and why is it important to still go see this odd assortment of pre-Industrial tools of trade? Nostalgia, that much maligned and yet celebrated practice of longing for the past through rose-tinted glasses, is certainly a small part of this collection’s appeal. There are some elements of kitsch. But, this journey to the past that Henry Mercer carefully created is so much more than that. Through the rooms of old confectionary molds, basketweaving braids, and cider presses you can see the effort that was required to create every aspect of human consumption. The sheer ease of our present-day lives is revealed amid these assemblies of typesetting tools and door hinges. In a world of DIY craziness, the Mercer Museum is an avenue for visiting a time when needlepoint was more than just a hobby and when home repairs required more than just a weekend trip to Loew’s. However, the museum is not finger-wagging its visitors for living in a post-Industrial age. Rather, the Mercer is one giant opportunity to find connections between the shared past on display and the very personal experiences that each visitor carries with them. Looking at the old tobacco shop statues reminded me of a family trip that we took to Wall Drug when I was seven, and I could not help but notice that the bundles of metal strips in the tinsmithing area were reminiscent of the color swatches I used to decide what color to paint my bedroom as we prepared to sell my childhood home. 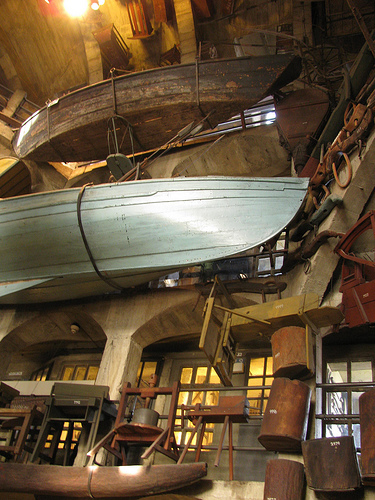 The Mercer Museum challenges you to look at these “everyday” items in a new way, enables you to make almost instinctual connections with the objects in the collection, and provides a time warp between the distant past, the recent past, the present, and the future. So, almost a century after its opening, can the Mercer Museum live up to the boastful claims of that newspaper headline from 1916: is this the greatest exhibit in the world? Well, no. In a world where new museums pop up every minute and the latest blockbuster exhibit rolls through every three months, it seems increasingly difficult for any exhibit to lay claim to that title. The museum world has changed drastically since the early days of the 20th Century. At the Mercer there are no high-tech interactives, this quirky collection of tools will never be the latest high profile exhibit on a world tour. Rather, it is in the running for another sort of title all together: most unique exhibit. There is an authenticity to this castle in the country, a very present sense of identity that runs through the concrete walls of the Mercer Museum that makes this collection stand out from all the rest.